Anthony Joshua is far from happy in the build-up to his fight with Alexander Povetkin, but that will bring the best out of him, says Johnny Nelson. The heavyweight world champion has been in an intensive training camp ahead of his Wembley Stadium showdown with the dangerous Russian on September 22, live on Sky Sports Box Office. Joshua went through the motions at a media day at the English Institute of Sport, in Sheffield, on Wednesday and Nelson believes the threat of Povetkin is all that is on the 28-year-old's mind, not the well-documented breakdown of a potential fight with Deontay Wilder. "He's in this situation where we are all making the mistake of looking past this and thinking April will be Wilder, or whoever, but he is not," Nelson told Sky Sports News. "He understands this is it. He is in against a live opponent that has got a better chance than anyone of beating him. I think aside from the (Wladimir) Klitschko fight, this will be his hardest performance. "That's why he has shut himself off. He actually trained this morning before we got in here and has done a little bit for us. "But he is not happy. He's not happy and that is actually good at this time of his training camp. You don't want to be complacent and he's not. He doesn't want to play the game but this is what he's got to do today. "Once that's done the doors will be shut, he'll be tired, mardy, frustrated and doesn't want to interact with other people. That is a good psyche to have at this stage in a fight because when it comes to fight night, that's what you're focused on, your leashes are off and then you can get stuck in." Joshua has promised to adopt an aggressive approach when he defends his IBF, WBA and WBC world titles against the former world champion. Nelson says Joshua is taking Alexander Povetkin very seriously - and knows it could be his hardest fight. 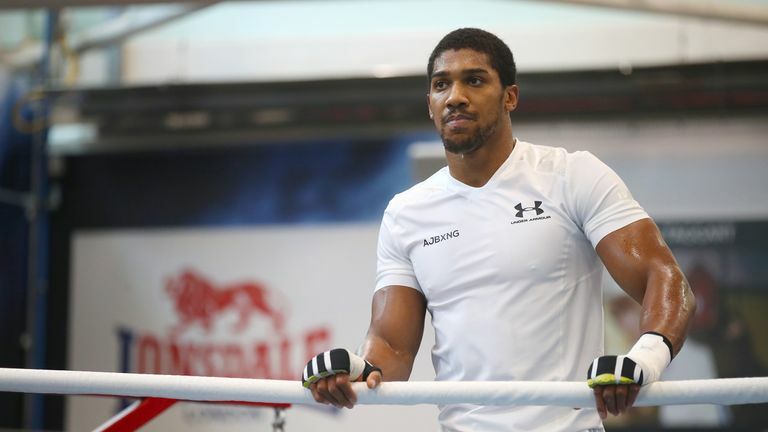 'AJ' will be making only his 22nd professional appearance - contesting his seventh world-title fight - and even if the British superstar says he is not the complete fighter yet, Nelson believes he will need to be at Wembley Stadium. "The stabilisers are off," he said. "I know he (Joshua) says 'look I am not the finished article', but he has to be the finished article now. "In his head he knows he can be better but as far as anyone else is concerned, he is the finished article, he's king of the hill. "He's shown he can box, can take a shot, he can fight, emotionally he is susceptible - like all of us - to get drawn in and he has shown every side of his arsenal. "Now he wants to get in the ring and do what he does."